All Mod Cons: Parmesan Cheese And Smarties! The way people, including myself, start blog posts has always fascinated me. I think the most common openings that kick off the flurry of words are "Well", "So", "Ok", or "Right". Not sure why this is, and it certainly has nothing to do with this post, but it's just a general observation. It's also something that I'm trying really hard to avoid. Sometimes I find it quite hard to come up with any sort of opening to what I want to write. I was told by my excellent English teacher at school that if you're writing a story or an article that the opening line or paragraph is of the utmost importance. You've got to really hook in the reader, give them something to keep them interested and a reason to keep on reading. Sometimes the start is the hardest place begin. Now that I've got that off my chest it's time for a brief summary of January. Having also mentioned about hooking readers into the rest of the post in order to maintain interest, I feel that I've failed already. Instead I am going to have a post that is heavily laden with videos and photos. Think less "Intelligent Prose" and more "Kids Picture Book". Earlier last month I went to Germany again, this time to visit Ze German and see the much awaited Oasis gig in Dusseldorf. Ze German's other half, M, very kindly got the 3 of us some tickets to go and see the local hockey team on one of the days. Not only was this my first ever live game, but it was also the local derby between Dusseldorf vs Cologne. 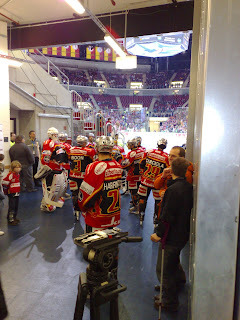 M also managed to get us some AAA passes for a while and just before the game we took a little wander around and ended up around where the players came out of the changing rooms and onto the ice. And here's a little video of the blokes whizzing around on the ice hitting some little black circular thingy around...one of which ended up in my hands via the ever resourceful M! Cracking souvenir. There were a few fights too! And they really go for it. The game is fast, hugely entertaining and excellent fun to watch. The players also put footballers to shame, even after brawling they just carry on with the game, albeit after sitting in the sin bin for a few minutes. It's helped me come to the conclusion that football is shite, footballers are utter nancy boys and hockey is definitely the way forward. I'd like to thank Ze German and M for arranging things and for putting me up for the few days that I was in Germany, much appreciated. Unfortunately the gig was cancelled just a few hours before the doors were due to open. Which was a significant bummer. Not only for the fact that I really wanted to see Oasis, but also because I was due to write a proper review...which could have had a serious importance attached to it (on this note, I am due to go to another gig on the 11th and write a review on that one...fingers MASSIVELY crossed for the end result...more will be revealed nearer the time and I may just be asking for everyones help...). The Oasis gig has been postponed until Wednesday, but I'm unable to go back for it....watch this space as for the reason why! All cloak and dagger at the moment eh! Some of you may have read elsewhere that I've got some new housemates. January saw the end of the couple that lived here...and they fucked off without paying all their bills...although I've now got all my money back from them, but not before a rather large amount of unnecessary hassle. Fuckers. And the lovely lovely Frenchie left to move in with her boyfriend, The Admiral. Seriously gutted about her moving on. However, The Viking and his Missus have moved in instead of having to commute a million hours a day. Couldn't believe it when the Missus actually went along with the idea! Playstation has been kept to a minimum and I've got 2 people in the house that I know I can trust. All is good. Last Friday Frenchie, The Admiral, Viking, Missus, Czech Boy and I all went out for a meal to the little Italian place up the road. And I've not had such a laugh for a long long time. I even managed a glass and a half of wine, which gave me an excellent opportunity to watch everyone else around me getting hammered. We had a fantastic waiter and the place was pretty empty, giving us ample chance to be loud and make with the merries. I ended up having Parmesan Cheese and Smarties on a spoon for dessert...the video of which is below. Unfortunately, Vikings memory ran out on the phone, missing out the part where we got the waiter to try it too. Whilst on the subject of videos...here's one from NYE...If you look to the left you'll see All Mod Cons little brother. They're all doing this drinking race with bottles of some orange stuff with Vodka in, using the straws to let in more air...meaning you have to drink it faster...oh the things the Youth get up to. And no, I remained on red wine the entire evening. Apart from the red that my brother spiked with the homemade punch in. How he thought I wouldn't notice is beyond me. But I drank it anyway. Well...I'm off. The Viking is hogging the Playstation and I want a go before I go to bed. The Dentist awaits tomorrow morning...oh joy of joys. Later! Sweetheart, if you're ever going to move to Canada (when is that btw??) you're going to have to learn to love and know hockey. It's almost a national requirement! Who knew hockey was such a big deal in Germany. You should most definatley take in a game if you come over here, we take hockey VERY seriously. Can you believe that they are having a debate about banning hockey fights? It's not called hockey if there aren't any fights! Thanks for the videos.I love watching hockey.Keep posting about the videos.